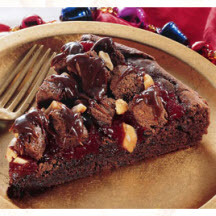 An eruption of flavor tops this chocolate brownie dessert, with its red 'lava' flow of cranberry sauce and strewn 'rocks' of brownie cubes and salted peanuts. Preheat oven to directions on brownie package. Grease a 9 1/4-inch quiche pan and an 8x8x2-inch square pan. Prepare brownies as directed on package. Spoon HALF of the batter evenly in the quiche pan and the other half evenly in the square pan. Bake about 20 minutes or until a tooth-pick inserted into the center of the brownie comes out clean. Cool completely. Cut HALF of the brownies in the SQUARE pan into 1/2-inch cubes. Cut the other half in the square pan into regular sized brownies to enjoy later. Spoon cranberry mixture over brownie in the quiche pan. Sprinkle brownie cubes and peanuts on top. Drizzle warmed fudge sauce over top of dessert. Cut into wedges to serve.